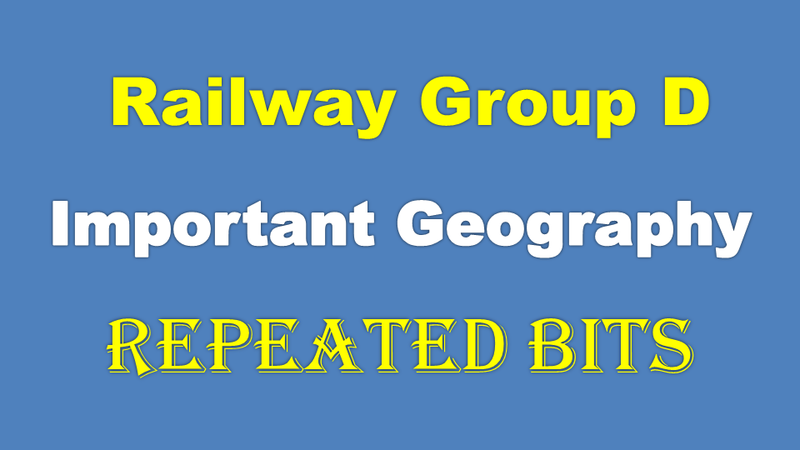 Geography Repeated Bits in Railway Group D Exams: Geography is the important topic for the all competitive exams like as SSC CGL, SSC CHSL and Railway, RRB NTPC Exams. 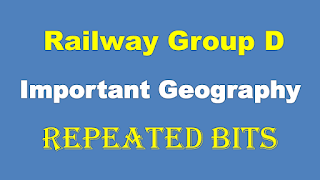 Below we give the Chemistry Objective Questions with Answers useful for who are preparing for the Railway Recruitment Board Examinations like as Railway Group D, ALP and other examinations. 2. Which of the following winds predominantly seasonal winds? 3. Which one of the following is not a necessary condition for the formation of heavy rainfall? 4 The phenomenon of trade winds takes place due to? 5. Sirocco is a name used to mean? 6. Winds and air currents differ in the aspect that? 7. Wind is often found to blow in a hot summer day due to? 8. Which of the following are the trends in direction of wind with the highest frequency over a particular point on the earth’s surface? 9. What causes wind to deflect toward left in the southern hemisphere? 10. Which one of the following is a planetary wind?